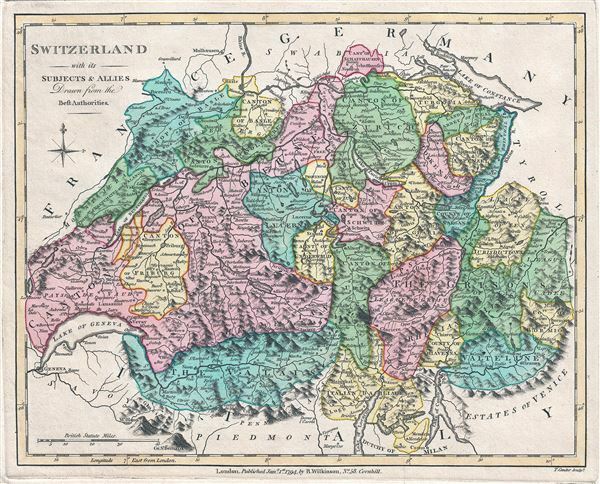 This is Robert Wilkinson's beautiful 1794 map of Switzerland. It covers the entirety of Switzerland divided into Cantons. With its unique blend of dramatic mountains and stunning vistas, Switzerland is considered to be one of the world's most beautiful places. The French tried to centralize authority of Switzerland by forming the Helvetic Republic (1798–1803). Until then the area consisted mainly of independent cantons united by a loose military alliance. Facing widespread resistance, the Republic would last only five years. The exquisitely rendered Alps and fine coloring make this the most attractive European map in Wilkinson's atlas. This map was engraved by Thomas Conder and issued as plate no. 11 in the 1792 edition of Robert Wilkinson's General Atlas.